There are some iPhone apps that are just plain ridiculous, and there are others that look ridiculous, but under the surface, contain something extraordinary. 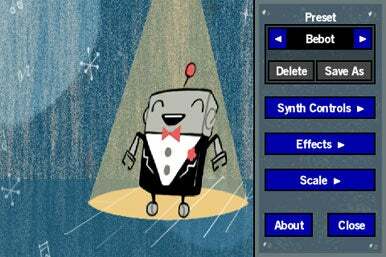 Normalware’s BeBot—Robot Synth is one of those remarkable apps. Entertain All Humans: It may look like little more than a singing robot that produces sound as you run your fingertip along the screen, but double-tap an icon in the lower right corner to unlock BeBot’s powerful four-voice synthesizer. At first glance, the $2 BeBot simply presents a fun retro style robot character. As you run your fingertip along the screen of your iPhone or iPod touch, you can produce sound and make the robot dance and sing. This alone can entertain a three-year-old (or the three-year-old in you) for hours. What’s not so apparent, though, is that underneath it all, BeBot is a very powerful, four-voice synthesizer. If you double-tap the icon in the lower right corner, this will expose controls for various presets, such as Theremin, Syntharp, and Pulse Wave Modulation. (You can also save presets of your own.) Within each preset are other controls, such as Synth Control, Effects and Scale. Without going into too much detail, these controls give you an almost infinite range of voicings you can produce. The best way to learn how to use an app this complex and powerful is to actually see it in action. The developer’s Web site provides some examples, but Jordan Rudess, keyboardist for the progressive rock band Dream Theater, has put together a video that is the best BeBot tutorial I’ve seen. BeBot—Robot Synth is a good example of what the iPhone platform is all about. From the perspective of both a musician and software developer, the iPhone provides a new and unique framework upon which completely new classes of instruments (and other programs) can be created. The only improvements I would suggest would be the ability to record/save your BeBot creations and to share custom settings with other users. In any case, BeBot is a truly incredible application that can entertain both serious musicians and three-year-olds equally as well. BeBot—Robot Synth is compatible with any iPhone and iPod touch running the iPhone 2.x software update.